Somersaults are one of my favorite snack foods. Like chips, they are the ideal form factor for snacking, perfectly crunchy. But unlike chips, they offer something nutritionally, as they are made from from sunflower seeds, wheat, and sesame seeds. 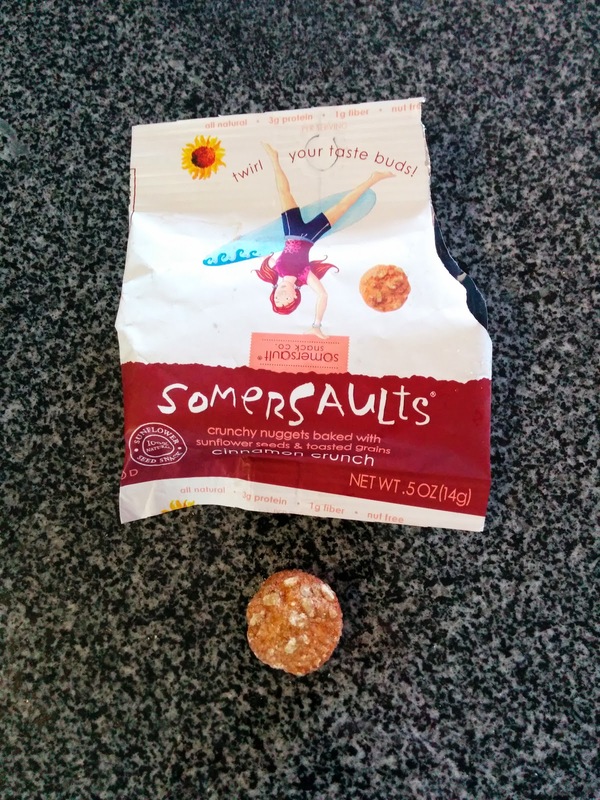 According to the company, "Somersault Snacks are a nut-free, healthy sunflower seed snack. Somersaults provide impactful nutrition offering the same amount of protein with just half the fat of a serving of almonds and fewer calories." Many snack bars make similar claims, but, unlike snack bars, Somersaults are actually tasty, and come in both sweet or savory versions, whichever matches your mood. I'll definitely continue seeking these out! 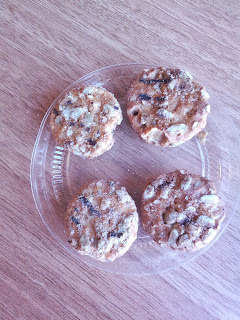 "Cinnamon Crunch bakes warm cinnamon into our whole wheat dough to create a delightful yet healthy treat. 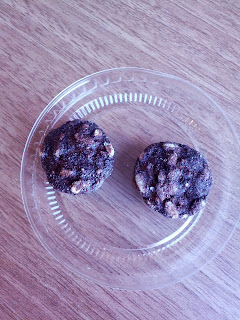 A little sprinkle of sweetness makes this perfect crunchy snack a coffee pairing delight!" I really liked this flavor. Super crunchy, perfect size to snack on. Hearty from the seeds, only a tiny bit sweet. A healthy tasting, yet slightly desserty, treat. Some sweetness came from cane sugar, but I tasted the molasses more. I liked the subtly from added chicory as well. Perfect for when I want something not quite savory, but not an all out sugar bomb. I'd gladly get these again. An interesting flavor combination, with the seeds and cocoa. It wasn't that successful for me, but I guess this is a healthier chocolate snack choice, if you are craving chocolate? Made with chili pepper, cilantro, a touch of jalapeño and a dash of lime. These had a nice kick to them. My favorite flavor, by far. Salty Pepper, Pacific Sea Salt. I started with the Salty Pepper. I really didn't like the pepper. It was too strong and didn't mix well with the other flavors in the little nuggets. Yet, somehow, I wound up with another bag of these. And this time, the pepper was more subtle. It wasn't awful, but I still don't want pepper on my snacky-snacks! My least favorite flavor. Next, I moved on to the simple Pacific Sea Salt, made from salt is sourced from the SF bay. These were nice and hearty, with a good saltiness, quite decent. Like all the varieties, I loved the crunch. Wise Sons is a Jewish Deli, with several locations in San Francisco. The biggest location is in the Mission, open for breakfast, brunch, and lunch, but they also have a space attached to the Contemporary Jewish Museum, lunch only, where you can dine in, or eat (and order) outside in the courtyard when the weather is nice. 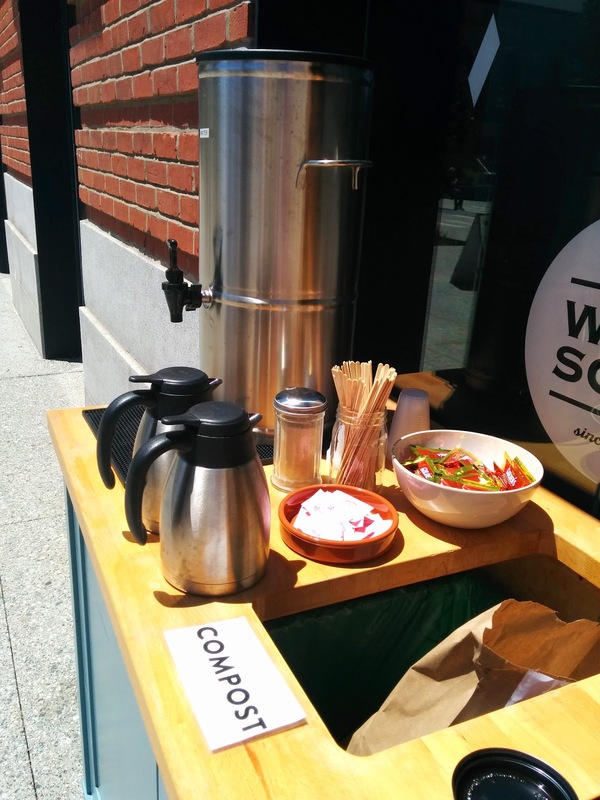 They also set up a booth at the Ferry Building farmer's market, which is where I first encountered them. I've tried a few different items, but I didn't really find anything I liked. Perhaps it is just because I'm not familiar with Jewish cuisine, so it was my first time trying many of these items. But overall, just not my thing. Fox Ubet Egg Cream. $3.50. This was my first egg cream, so I have no comparison point. I wanted something refreshing, and I've heard about egg creams forever, so my curiosity finally lead me to order it. It is just seltzer, runny chocolate syrup, and milk. Hmm. I somehow thought it would be more like a milkshake, although I'm not sure why. It was basically like diluted milk that was fizzy. I really didn't get it. 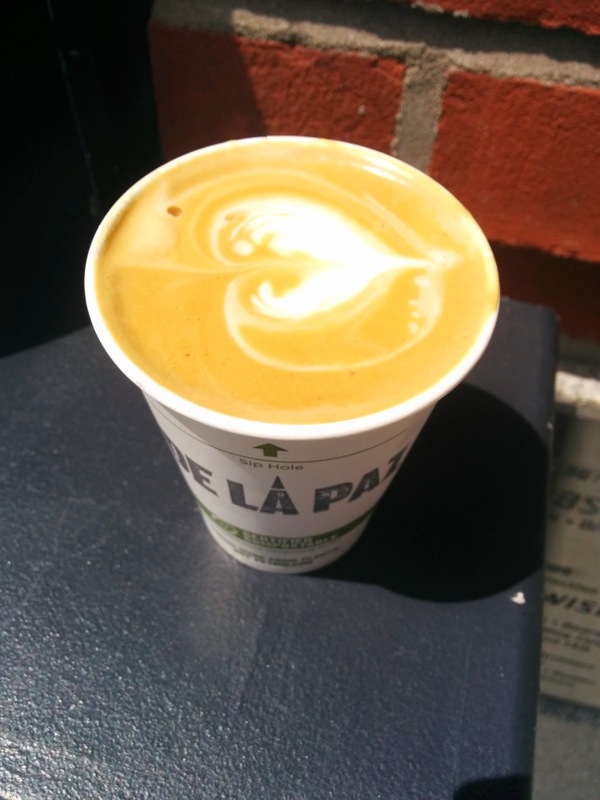 Wise Son's uses De La Paz Coffee, a local San Francisco roaster. I've seen them around town often, but this was my first time trying their product. The wait for my cappuccino was extremely long, about 15 minutes. I actually went back to check on it around the 15 minute mark because I thought it must have been forgotten. They weren't busy. Even Blue Bottle doesn't take this long! Anyway. The foam was beautifully done. Microbubbles of perfection. But ... the coffee wasn't great. Bitter, not in a good way. Maybe they don't do a lot of decaf, or maybe De La Paz decaf just isn't very good. The barista certainly demonstrated skill with the foam so I don't blame him. I wouldn't get another. The $3.50 price was standard. 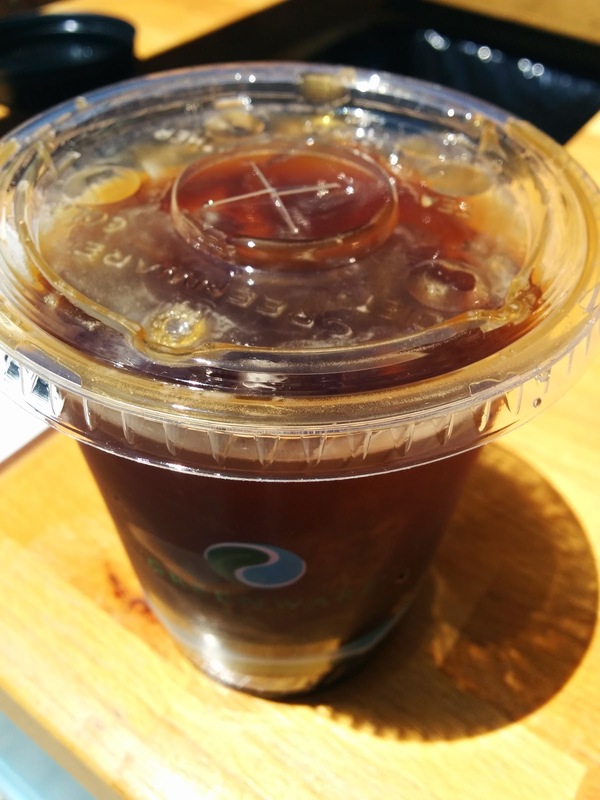 On a hot day, I decided to get an iced coffee. They only have regular iced coffee, but offered to do an iced Americano instead. For the coffee, half and half and whole milk are available, along with sugar, Sweet & Low, and Splenda. Side of Potato Salad. $2.79. 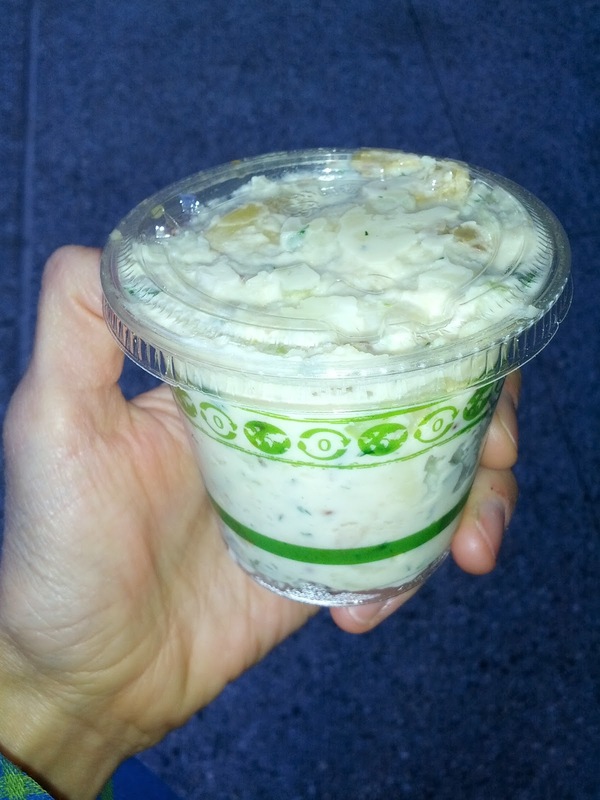 This was very, very creamy potato salad, mayo based. At first glance I was a little confused that I received the proper item, as I couldn't even see chunks of potato, just creaminess! The potatoes had skin on, which I didn't like, as they were kinda slimy and mixed in. The potatoes were well cooked however, not too mushy. The dressing was mostly mayo, but also had a slight interesting flavor from some grainy mustard, but not much. There were also chunks of crisp, but almost too harsh, red onion. Overall, this was fine, but not remarkable. I like to have a little more zing to my potato salad, and like things like pickles or egg added. The portion size was smaller than I expected, although not unreasonable for the price. I wouldn't get it again. Side of Cole Slaw. $2.50. Fairly standard slaw. Two colors of cabbage, not over dressed, something interesting in the seasoning, it was a bit ... zesty? Neither Ojan nor I loved this, but we also didn't hate it. Unremarkable. Price a bit high for tiny portion. Wise Sons is known for doing their own brining, so I was excited to check out their pickle plate. I adore pickles. My great aunt, who lives on a farm and grows all her own vegetables, makes the most amazing pickles ever. She pickles everything - obviously cucumbers, but green beans, carrots, cauliflower, peppers, zucchini, etc. Some sweet, some savory, some spicy, and everything in between. Let's just say that I didn't encounter those strange store bought things that they call pickles until very late in life. I still don't understand them. 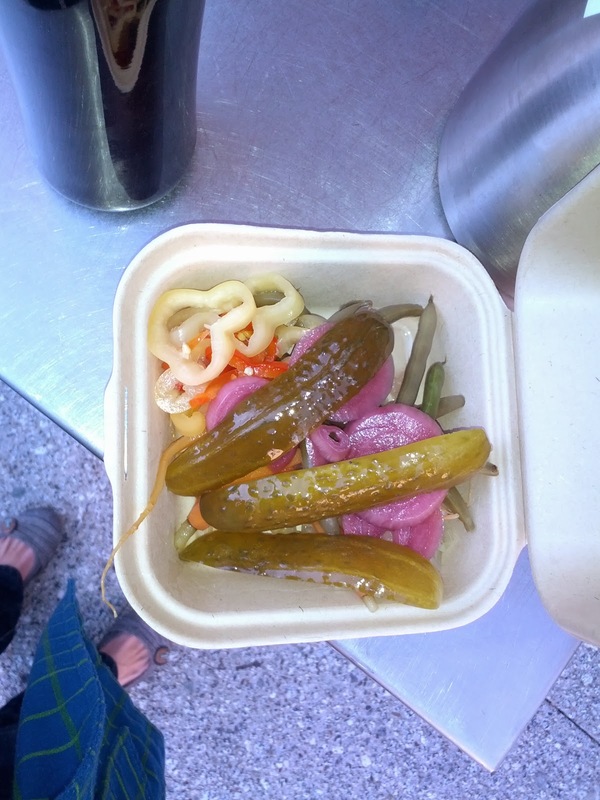 The Wise Sons pickle platter contained sauerkraut, green beans, red onions, carrots, sweet peppers, and some classic spears. I really did not like the baby carrots. Far too vinegary for my liking. My least favorite on the platter. The onion was a bit strange. It somehow tasted fishy. I really don't understand how, but I didn't like this one either. The classic spear was ok, a bit mushy, not as crisp as I like, and the the flavor wasn't quite what I like. Pretty middle of the road. The kraut was good, and I can see how it would make their sandwiches awesome. A bit strange on a pickle plate however, as it was odd to just eat by the spoonful. But flavorful, crunchy, fresh. My third favorite overall. The beans were good, crisp, but I love my aunt's dilly beans, and these were just vinegary, so I didn't like them as much as hers. My second favorite on the platter. The peppers were delightful. Sweet, but vinegary, in a really fascinating way. I'd easily eat tons more of these. Mandel Bread. 2 for $1.50. And finally, I wanted to try something sweet. I wasn't familiar with mandel bread before, but I remembered reading that Wise Sons was famous for theirs, and the generous cinnamon and sugar coating drew me in. 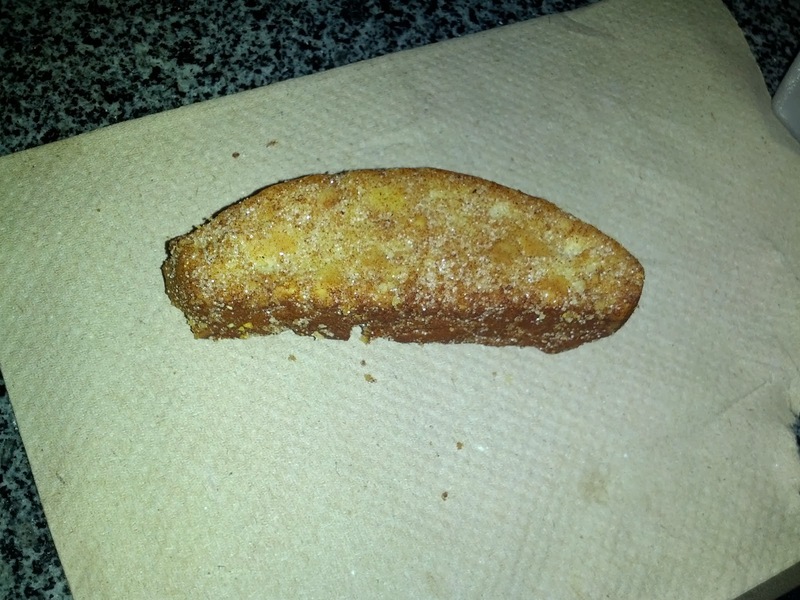 This was basically almond biscotti, covered in cinnamon and sugar. Crispy. Good crunch from slivered almonds inside. It was good enough, better when dunked into coffee. Not something I'd get again just because it isn't very exciting to me, but if you like biscotti and cinnamon/sugar, it was fine. $1.50 was a good price for two small pieces. 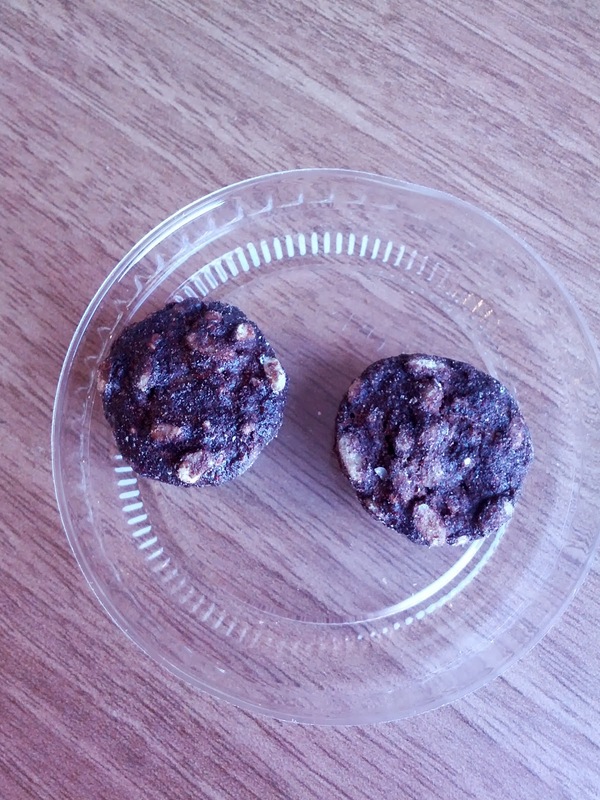 This was a hard, crisp cookie. I greatly prefer soft, almost under-cooked, cookies. 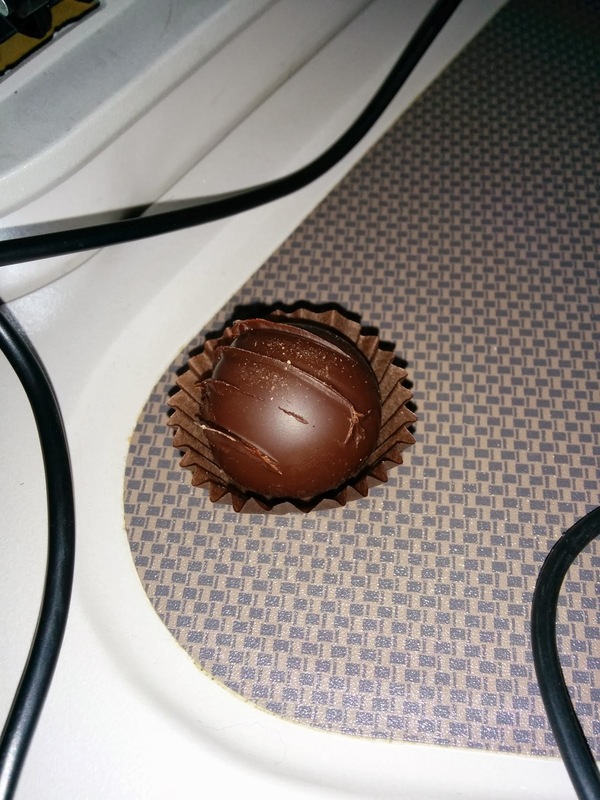 It was loaded with chocolate, hard to see here, but it almost wasn't even chips, the entire thing was just chocolate. Which, perhaps might be good, except that I actually like to taste buttery cookie dough, so this wasn't a winning aspect for me. 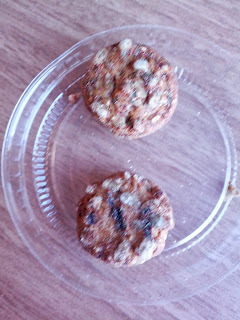 Really not my style of cookie. 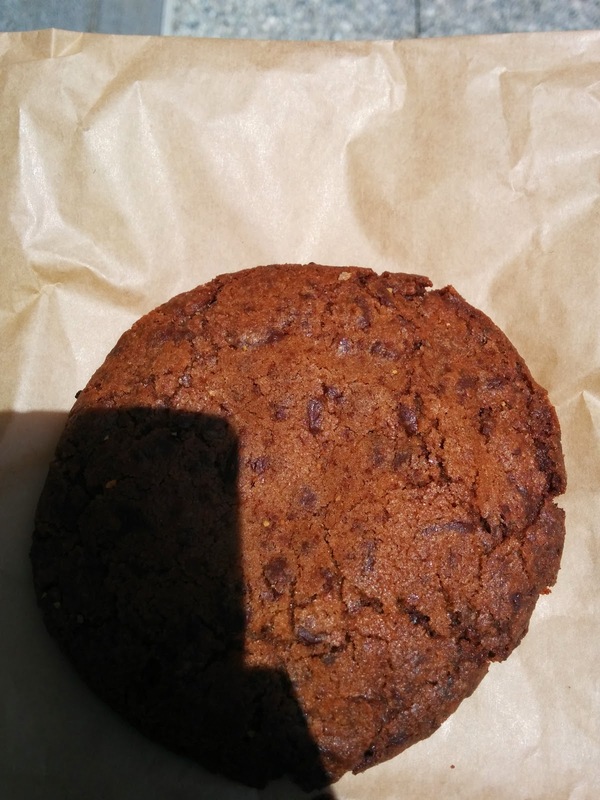 $2 price was fine for quite a large cookie however. I've tried the babka many times, as they always have it out to sample, and it is hard to resist a sample while I wait for my order. But it is always so dried out. Maybe that is why they are sampling it, because its old? I don't know, I love bready sweet things and this has absolutely never interested me. I feel a bit silly reviewing this since it was my first kugel ever, so I don't really know what I'm talking about. Offered deep fried and warm with maple syrup, or cold with seasonal jam. Since I was taking it to go, I opted for the cold version, but I'm intrigued by the idea of the hot, fried, version. 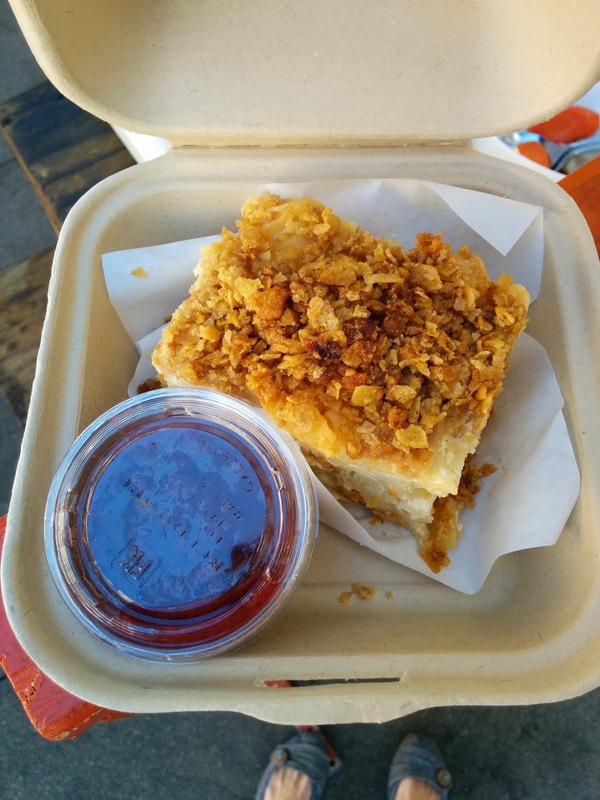 I had of course heard of noodle kugel before, but I've never seen it, much less eaten it. So, I didn't really know what I was getting into, my vague idea was that it was supposed to be sorta like a noodle casserole, but a dessert, so like bread pudding but with noodles? And a crispy top? And maybe not a dessert, more of a brunch item? I love bread puddings, and I like noodle casseroles, so ... seemed like something I might like. I still don't entirely know what I ate. Yes, it was a noodle casserole. The noodles were in some sort of custard ... my research tells me it might have been cream cheese. Or sour cream. Or cottage cheese. I have no idea what it was. It also had some golden raisins. On top was crispy things, a bit sweet. I have no idea what they were either, but reminded me a bit of corn flakes? I tried a few bites immediately, even though I was planning to save it for later, and I enjoyed the crunch from the topping, the custardyness of the filling, the softness of the noodles. All the things I like about a good bread pudding. I did wish it had more spicing, but I'm not quite sure what I wanted. Served with "seasonal compote", which I think was raspberry. It was sweet, went well with it, but, wasn't nearly as good as my mother's homemade jams. I brought the rest home and tried warming it up, to see how it was that way. It didn't heat that well, the noodles and custard sorta separated. The top got nice and crunchy though, and I really think it would be good warm, perhaps when freshly baked. I also added my mom's peach jam, and then tried drizzling maple syrup over it. The syrup was the real winner for me, and I see why they serve the fried one with syrup. So, for me, I think I'd love to try it hot and fresh sometime, but otherwise, cold worked better. Maple syrup was a winner. And I think I'd like it for breakfast, paired with a coffee. It didn't quite meat my "dessert" desires, but if you have less of a sweet tooth than me, I think it easily could. Brunch is likely where it best belongs. I'm still trying to figure out how to classify or explain noodle kugel to someone else unfamiliar. Bread pudding made with noodles instead of bread is my best description, but that doesn't get the custard part quite right. Or fettuccine-alfredo-quiche? I guess it just falls into that nebulous category of dishes that are a carb-in-a-custard, like bread pudding or rice pudding, where there are so many different spins, they can be sweet or savory, they are hot or cold, they have toppings or mix-ins, etc. I'm certainly interested in exploring kugel further! As you read about last time, my recent business trip to Tokyo didn't begin exactly as planned. I ranted a bit about the disaster that was my JAL flight, or, specifically, lack thereof, so I'll spare you re-hashing it again. 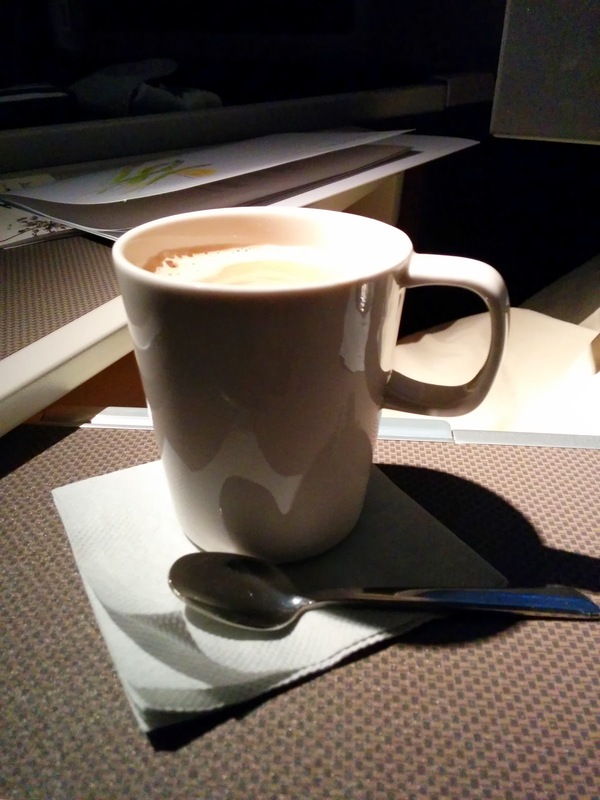 Let's just say that when I finally boarded a Cathay Pacific flight at midnight instead, 7 hours later, I wasn't in the best mood. I was tired, I was hungry, and I was really questioning my decision to fly the extra distance to Hong Kong, just to connect to Tokyo. But, I was going to get to Tokyo, and that is what mattered, right? And, I'd heard many great things about Cathay Pacific. 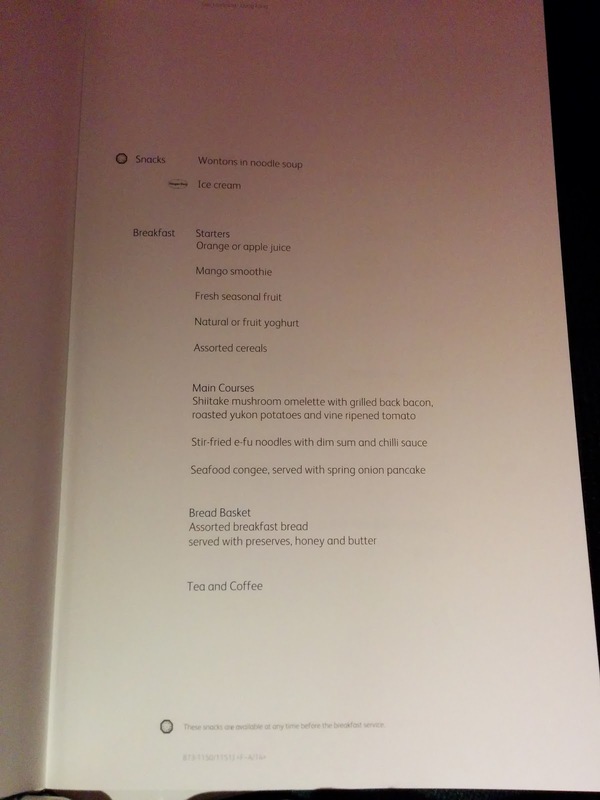 They are known for really having a premium product: excellent food, great service, modern aircraft. Now, I have another tragic story. I wrote a lovely post up about my flight experience, right after my travel, while it was fresh in my head. I included details of the service, the wonders that were my seat, and of course, a very thorough review of the food served. And ... I lost it. I'm not sure what happened, but, the draft of the whole thing I had in Blogger was replaced with something else. 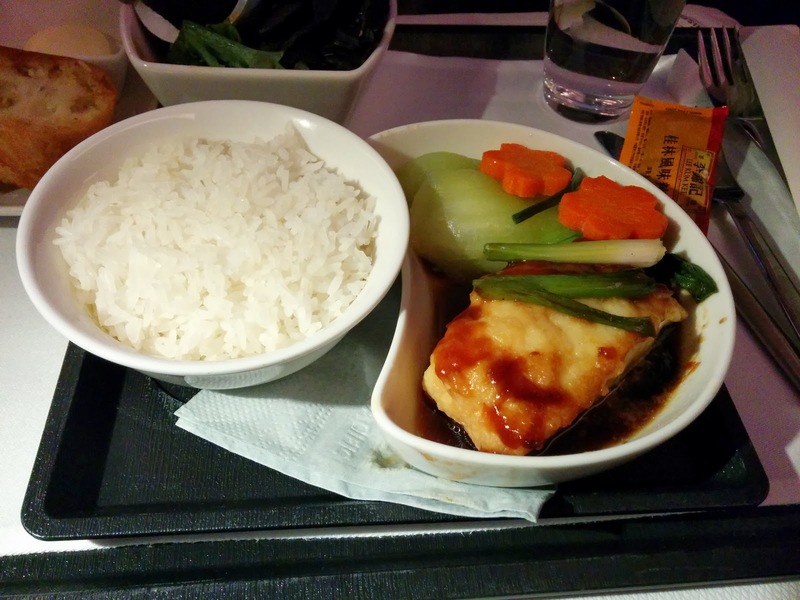 Luckily, I still had my tasting notes, in my handy little food blogger notebook, so I've been able to re-create my review of the food, but all my observations on the actual flight have been pretty lost. And many subtleties of the meals. Alas, this is better than nothing right? What I do recall is that the flight was actually quite nice. My grumpiness did disappear. The service was indeed good. I loved my seat, and it transformed into a quite comfortable bed. And the 14 hour flight time, which sounded long at first, turned out to be a wonderful length: I was able to settle in, eat a full meal without rushing to get to sleep, change into my pajamas, get a full night's rest, have breakfast, and still not feel rushed. In fact, I sorta think I'd pick to do this again, rather than just flying direct to Tokyo, particularly if it meant I could fly with Cathay again ... they really are a fantastic airline. 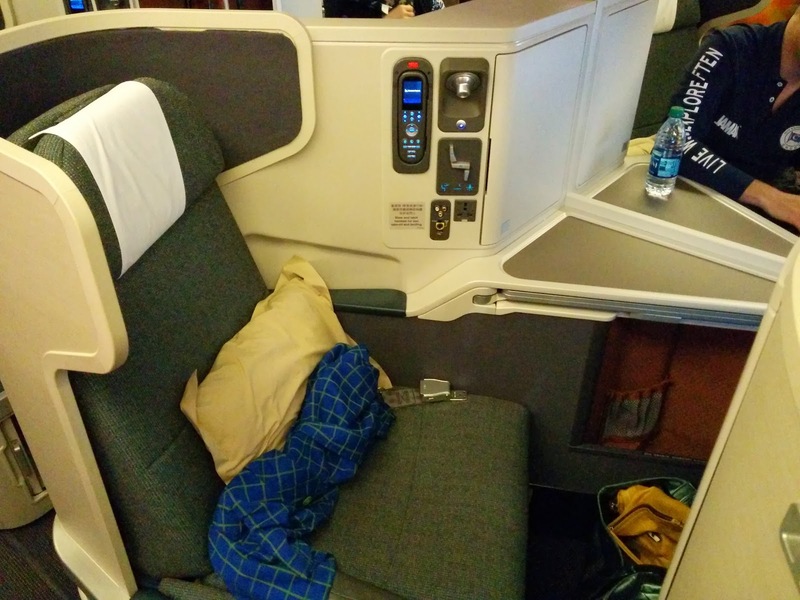 I was seated in Cathay's "new business" class, and it was a very impressive business class offering. The seat was clearly well designed. I did find it slightly better designed for sleeping rather than sitting, but, since that is what I'd be doing for the majority of my flight, I didn't mind too much. 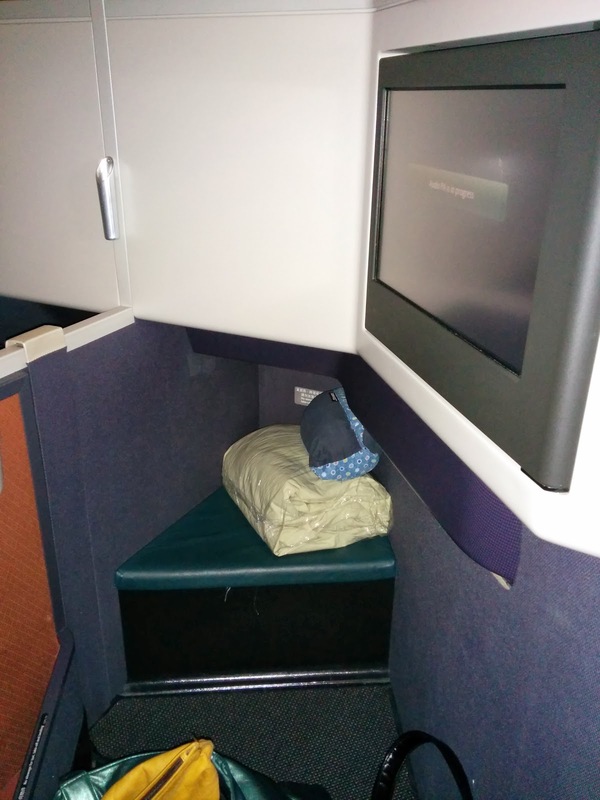 My seat had all the amenities you could desire: power, usb charging ports, 3 different lights, a small side table, a large dining table that pulled out, and a cubby where the headphones could live. There was a pocket for my water bottle, and even a cubby for my shoes. Easy to find a place for everything. At the foot of the seat was the ottoman, which would turn into the end of my bed once I transitioned into sleep mode. The seat went fully flat. I was provided with a very large blanket, comforter style, very comfortable. The TV screen was impressively large, all touch screen. I didn't end up using it on the flight though. Followed by desserts: a cheese platter (camembert, yellow cheddar, danish blue), fruit, or caramel cheese cake with chunky berry coulis. For those who wanted a lighter meal, since it was so late, a soup (butternut squash) or salad (mesclun with smoked duck breast, tear drop tomato, fig, and balsamic vinaigrette) were available. I was thrilled by this menu. Every single course sounded good to me. Cathay clearly spoke to my cuisine preferences. Service began with a hot scented towel. 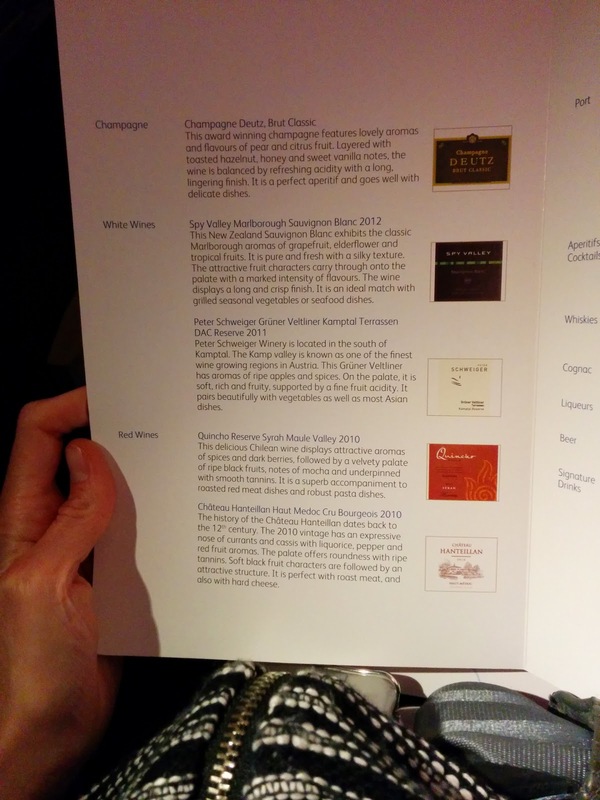 Drinks: Champagne, White Wine, Red Wine. Next, the drink menu. Not extensive, but since I'd spent the last few hours bored out of my mind in teh airport lounges, I'd been drinking, and didn't really care for more. A single Champagne: Champagne Deutz, Brut Classic. But as I said, I didn't have any, I was too burnt out by my travel experience already at this point. Supper Starter: Mesclun salad with grilled scallop and sesame oriental dressing. Bread and butter. To begin the meal, we had no choice of starter, which was fine with me, since I love scallops, and would have picked this over many other choices anyway. My tray also came with water and silverware. I liked how the silverware packets always contained two forks and knives. The base of the salad consisted of basic mesclun, just greens, but fresh enough, along with two roasted red peppers and two sun-dried tomatoes. They added a pop of flavor, but otherwise were quite standard. The scallops also came in a pair, served cold on top. They were far better than I expected. Sure, cooked all the way through, not mid-rare, but they were tender and sweet, not rubbery, not fishy, actually fresh tasting. Both a large size, with actual visible grill marks. 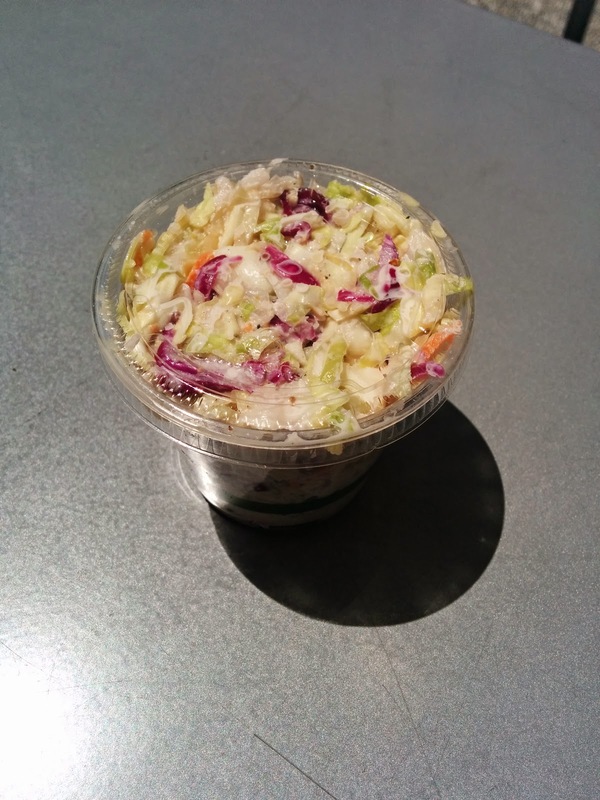 The sesame oriental dressing came on the side, in a little container. It was sweet, but not overpowering, really, not bad. I also had the choice of bread, either sourdough rolls, or garlic bread. Obviously, I went for the garlic bread, since I don't like sourdough. It smelt incredible. Sadly, the bread did not taste as good as it smelt. It was soggy, and very oily. The garlic flavor was as fantastic as it smelt though. This dish surprised me. 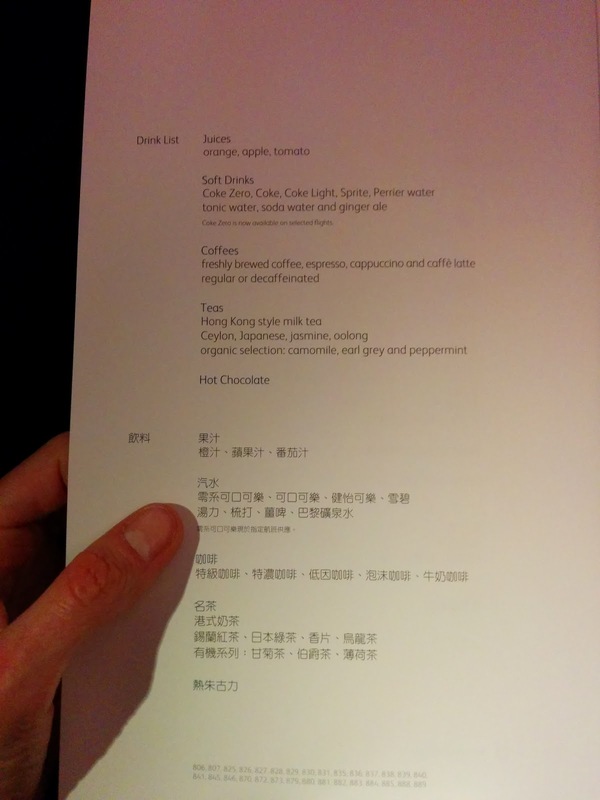 I had no idea what to expect from Cathay Pacific, although I knew they were known for their cuisine, and this set things off on a strong note. Not the way I prefer to eat my scallops obviously, but for business class cuisine on an airplane, this was quite good. Super Main Dish: Cod with sweet wine sauce, steamed jasmine rice and stir-fried pak choy with carrots. Next up, my main dish was served. I had the choice of beef or cod, and, obviously, I went for the cod. I eat a lot of seafood, and cod is always a favorite of mine. Unfortunately, the main dish was no where near as good as the starter, and not nearly as good as it sounded. The rice was probably the best part, and that is saying something, since I dislike rice. Probably not intentional, but the top of the rice was crispy, which I enjoyed. The fish came as a generous chunk, but was way overcooked, severely dried out. The veggies were completely mushy, although I appreciated the cute cut of the carrots. The sauce, always a saving point for me, was kinda ok, a bit sweet. The only bites of this that I could tolerate was some of the crunchy top rice drizzled with some sauce. Service throughout my meal was quite attentive, and my dishes were quickly cleared whenever I was finished, or, in this case, when I indicated that I didn't want any more. Drinks: Spirits, cocktails, signature drinks. 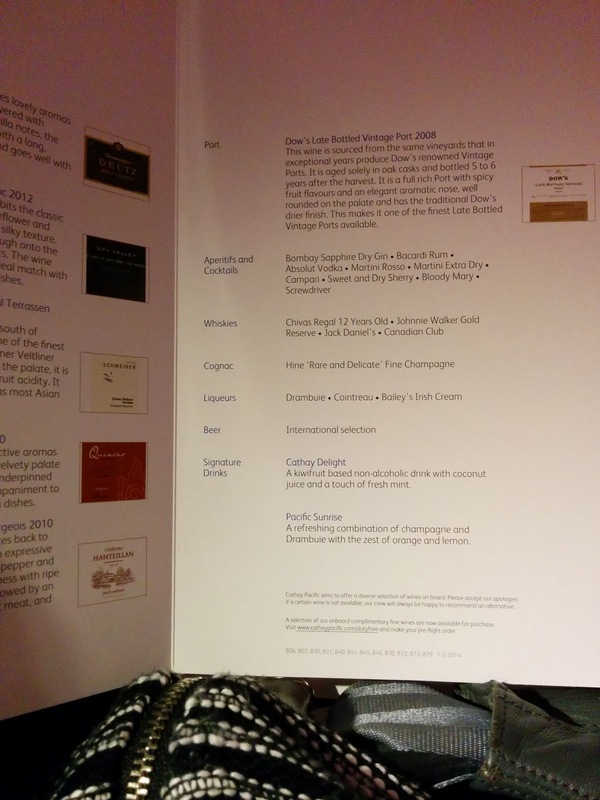 The rest of the alcoholic drink menu contained aperitifs, whiskies, liquors, and beer, along with the Cathay Pacific "Signature Drinks" (the Pacific Sunrise and the Cathay Delight), and, a port. I decided that my dessert would go nicely with a glass of port. Supper Dessert: Caramel cheese cake with chunky berry coulis. Dow's Late Bottled Vintage Port 2008. After the lackluster main dish, I was looking forward to dessert. While cheesecake isn't one of my absolute favorite desserts, it is one that I do enjoy, and, seemed like something that would be fairly easy to execute well on a plane, since it doesn't need to be super fresh and isn't temperature sensitive. I was served a very generous slice. 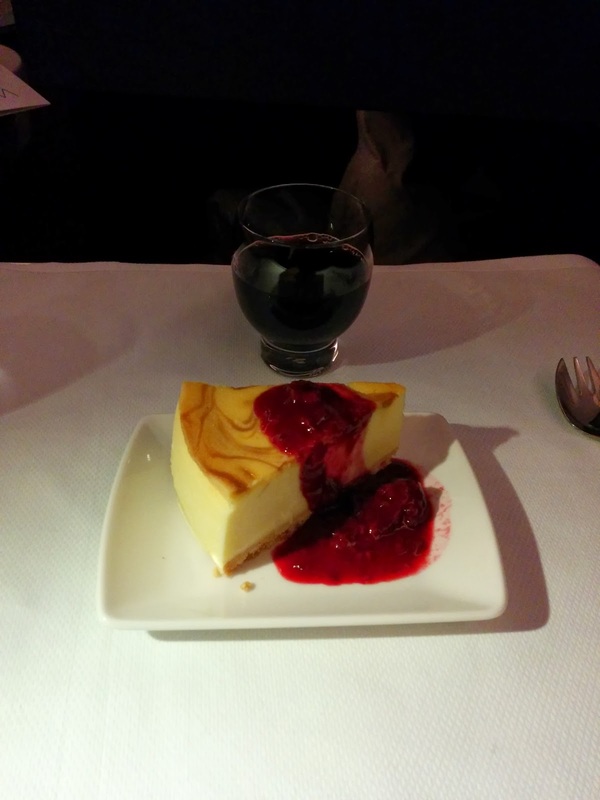 The cheesecake was creamy, which I liked, but was otherwise unremarkable and quite generic. Where was my promised caramel? It seemed to just be the little swirl on top, not enough to taste. The crust layer was thin and was totally lost under the giant slice of cheesecake. The berry coulis was quite good, and well presented spooned over my slice. It was sweet, and clearly contained raspberries. I also enjoyed my port. Nothing remarkable here, but, I finished quite satisfied. To go along with my port and dessert, I also ordered an after-diner coffee, decaf of course. It was fine. And to finish the meal, an after-supper chocolate! After my slumber, it was time for breakfast. All were served with a bread basket of assorted breakfast breads, served with preserves, honey and butter. As with supper service, the meal began with an offer of a nicely scented hot towel. I hoped for a Hong Kong style milk tea, and really enjoyed it. Sweet, creamy, and just caffeinated enough to give me a needed jolt. Breakfast Starter #1: Mango smoothie. Apple cinnamon swirl, preserves, honey, butter. Breakfast began with an offer of drinks. 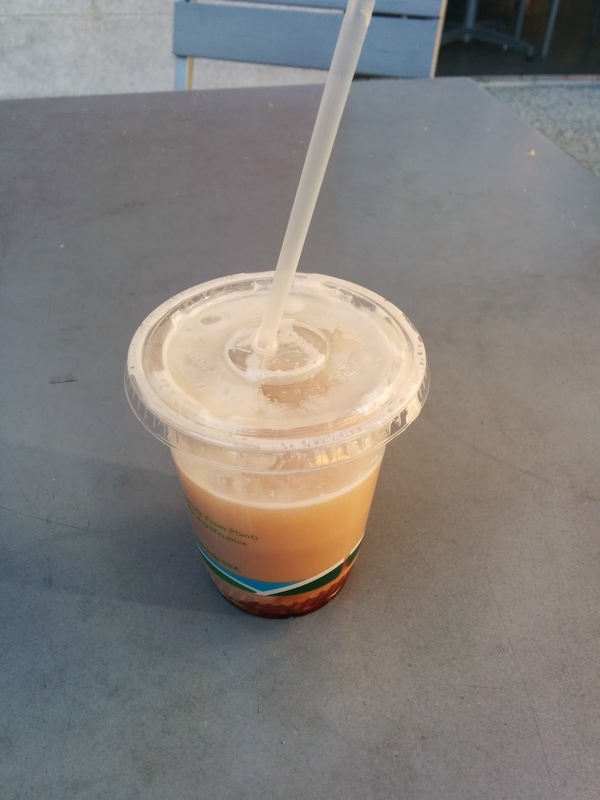 I decided to start with a mango smoothie, as it sounded refreshing and pleasant for waking up on the flight. It turned out to just be Odwalla brand, very thick. It wasn't served cold enough for my taste. 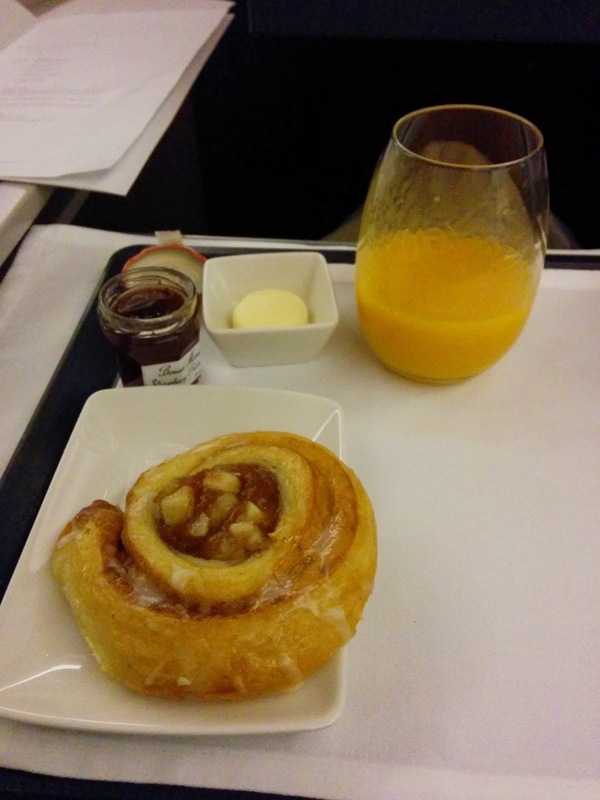 Next, a bread basket was presented with a choice of breakfast breads - a croissant, bagel, or apple cinnamon swirl. I went for the most decadent one, the apple cinnamon swirl. 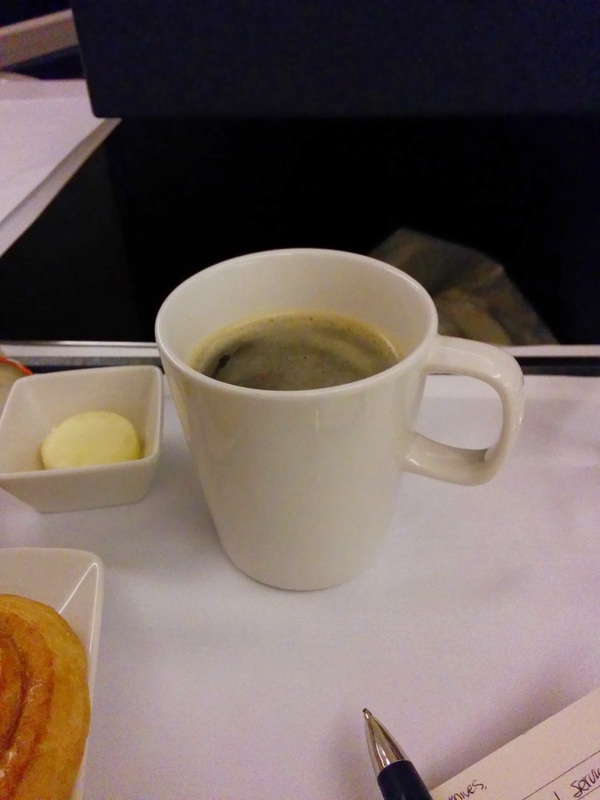 None of the breakfast breads were served warm, minus one point for Cathay. Warm breakfast pastries are always better! My pastry was very generic, a bit stale tasting. The apple chunks inside were mushy and seasoned with way too much cinnamon. I did like the sweet glaze on top. The bread basket also came with my choice of preserves (Bonne Mamman brand, strawberry or orange), honey, butter, or cream cheese. None of these really make sense given the item I picked, but would have worked with the plainer choices. I also ordered a decaf coffee to go with my breakfast. They didn't have any decaf when they came through with the cart, so had to go fetch it for me separately. It was very strong and dark, but not that good. Served with cream, sugar, and Equal. There was a very long pause between the breakfast breads and the next course. The breakfast service was much slower than supper, a long, drawn out affair. I think this was intentional, as the idea behind having supper rather than dinner is that it is expedited so that people can get to sleep. Still, multi-course long breakfast wasn't quite what I was expecting. Not that I had anything else to be doing. 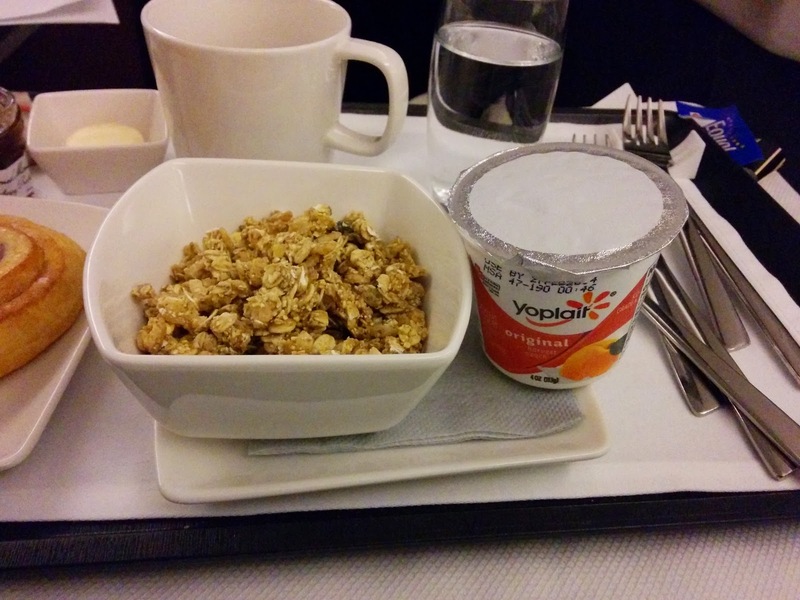 Breakfast Starter #2: Granola, yogurt. Next, a set of light starters was offered from a cart: fruit, yogurt, or cereals. The fruit platter consisted of melons, pineapple, and strawberry, so I had to decline it, due to my melon allergy. Cereal was Kellogg's: Special K or granola with raisins, served with milk or yogurt. The yogurts were Yoplait brand, offered in plain or peach. I used to love Kellogg's granola, so I was excited to see it. It had been years since I'd had it. I decided to get yogurt to go with, in order to make a parfait, and went for the peach. The yogurt was creamy, but way, way too sweet. I couldn't stand it. The granola was pretty much what I remembered, crunchy and good, and I appreciated the chunk sizes, but without any milk and with yogurt that I didn't want, I didn't quite know what to do with it. I ended up just using the granola as something to nibble on with my coffee while I waited for the next course. Next time, I'd get it with milk. Anyway, it was not a good pick. 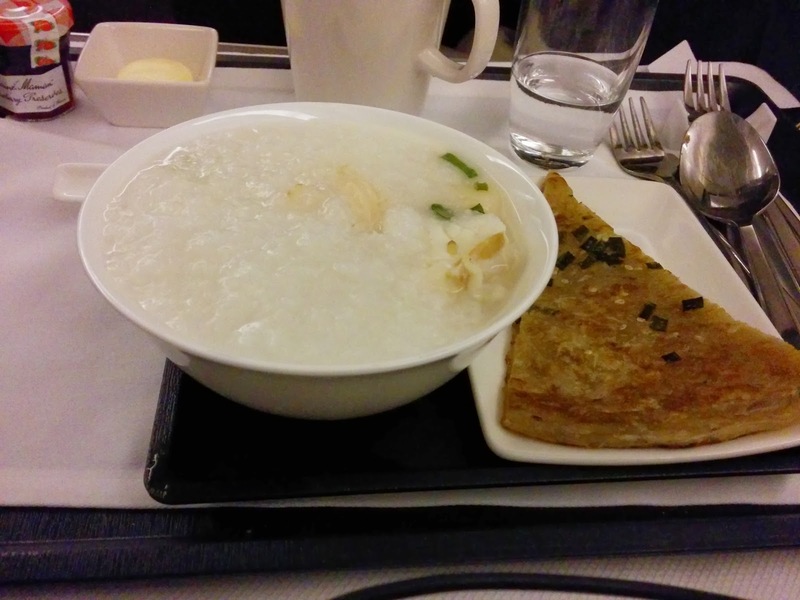 The congee was really watery, and quite gross. It was loaded up with a generous amount of seafood, shrimp, fish, and bay scallops, but tasted really fishy. The spring onion pancake was crazy oily, wet, and cold. Well, hello there. You may have noticed that I've been a bit silent for the past few weeks. Don't worry, I'm perfectly fine, I've just been traveling - to Spain, Zurich, and London! And, like any good food blogger, I was busy documenting all the interesting foods I consumed during my travels. And yes, there were Michelin stars. And foie gras. Lots of foie gras. Since I have a large line up of travel posts for Travelin' Tuesdays: Tokyo Edition, I've decided to give the regular Monday lineup up chain restaurants/food trucks a brief break, and I present you with a new special series: Mallorca Mondays! Mallorca, or Majorca, is an island off the coast of Barcelona, the largest of the Balearic Islands. While not a gastronomic destination, it does have 5 restaurants with Michelin stars, and it wasn't exactly a coincidence that the villa we rented just happened to be right down the street from one of them. So, stay tuned for the new few Mondays, as we journey to Mallorca. We'll begin with my very first experience on British Airways, flying First Class no less, from San Francisco to London. 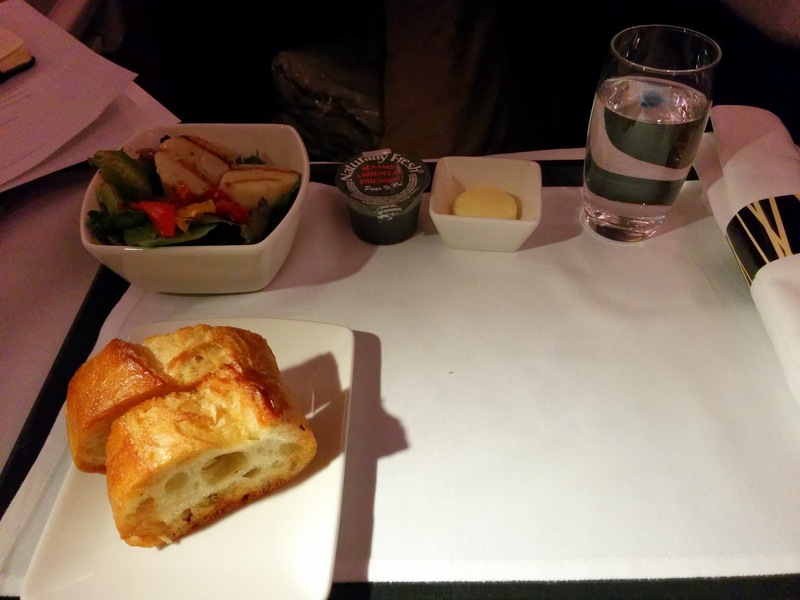 Dining on a plane may not normally be all that exciting, but in First Class, dining is a serious part of the experience. 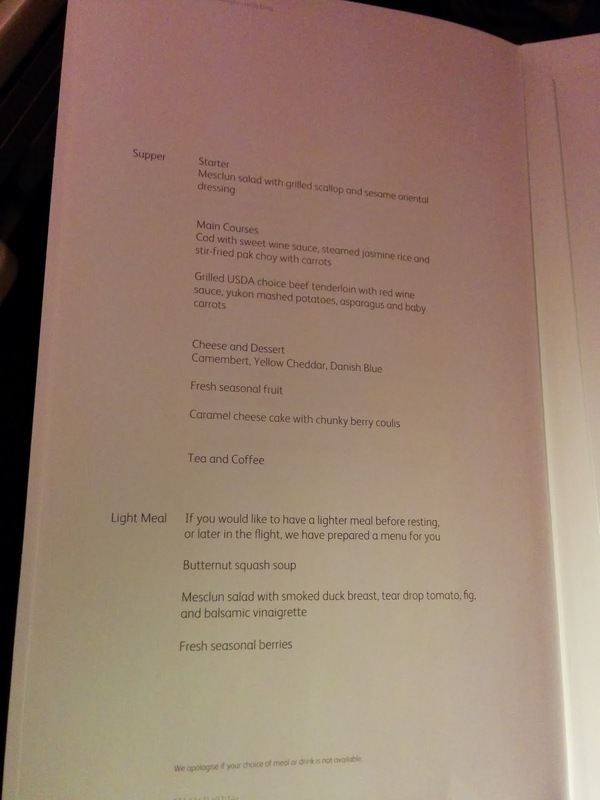 Next, you'll get a peak at the afternoon tea service, served aboard a British Airways flight from London to Barcelona, business class (or, Club Europe as they call it). And then, time to dine on Mallorca! Ok, first we need to discover our local beach bar, Playero, but then we'll head with a long lunch at Michelin-stared Jardín, followed by a late lunch at the stunning Restaurante Golf Alcanada, and sample the Mallorca pastry ensaïmada.